A team of MIT researchers has designed a breathable workout suit with ventilating flaps that open and close in response to an athlete's body heat and sweat. These flaps, which range from thumbnail- to finger-sized, are lined with live microbial cells that shrink and expand in response to changes in humidity. The cells act as tiny sensors and actuators, driving the flaps to open when an athlete works up a sweat, and pulling them closed when the body has cooled off. The researchers have also fashioned a running shoe with an inner layer of similar cell-lined flaps to air out and wick away moisture. Details of both designs are published today in Science Advances. Why use live cells in responsive fabrics? The researchers say that moisture-sensitive cells require no additional elements to sense and respond to humidity. The microbial cells they have used are also proven to be safe to touch and even consume. What's more, with new genetic engineering tools available today, cells can be prepared quickly and in vast quantities, to express multiple functionalities in addition to moisture response. To demonstrate this last point, the researchers engineered moisture-sensitive cells to not only pull flaps open but also light up in response to humid conditions. "We can combine our cells with genetic tools to introduce other functionalities into these living cells," says Wen Wang, the paper's lead author and a former research scientist in MIT's Media Lab and Department of Chemical Engineering. "We use fluorescence as an example, and this can let people know you are running in the dark. In the future we can combine odor-releasing functionalities through genetic engineering. So maybe after going to the gym, the shirt can release a nice-smelling odor." Wang's co-authors include 14 researchers from MIT, specializing in fields including mechanical engineering, chemical engineering, architecture, biological engineering, and fashion design, as well as researchers from New Balance Athletics. Wang co-led the project, dubbed bioLogic, with former graduate student Lining Yao as part of MIT's Tangible Media group, led by Hiroshi Ishii, the Jerome B. Wiesner Professor of Media Arts and Sciences. In nature, biologists have observed that living things and their components, from pine cone scales to microbial cells and even specific proteins, can change their structures or volumes when there is a change in humidity. The MIT team hypothesized that natural shape-shifters such as yeast, bacteria, and other microbial cells might be used as building blocks to construct moisture-responsive fabrics. "These cells are so strong that they can induce bending of the substrate they are coated on," Wang says. The researchers first worked with the most common nonpathogenic strain of E. coli, which was found to swell and shrink in response to changing humidity. They further engineered the cells to express green fluorescent protein, enabling the cell to glow when it senses humid conditions. They then used a cell-printing method they had previously developed to print E. coli onto sheets of rough, natural latex. The team printed parallel lines of E. coli cells onto sheets of latex, creating two-layer structures, and exposed the fabric to changing moisture conditions. When the fabric was placed on a hot plate to dry, the cells began to shrink, causing the overlying latex layer to curl up. When the fabric was then exposed to steam, the cells began to glow and expand, causing the latex flatten out. After undergoing 100 such dry/wet cycles, Wang says the fabric experienced "no dramatic degradation" in either its cell layer or its overall performance. 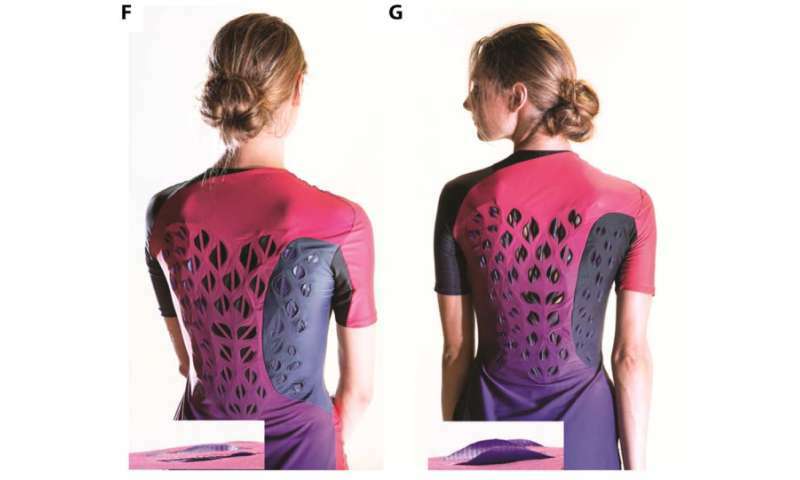 The researchers worked the biofabric into a wearable garment, designing a running suit with cell-lined latex flaps patterned across the suit's back. They tailored the size of each flap, as well as the degree to which they open, based on previously published maps of where the body produces heat and sweat. "People may think heat and sweat are the same, but in fact, some areas like the lower spine produce lots of sweat but not much heat," Yao says. "We redesigned the garment using a fusion of heat and sweat maps to, for example, make flaps bigger where the body generates more heat." Support frames underneath each flap keep the fabric's inner cell layer from directly touching the skin, while at the same time, the cells are able to sense and react to humidity changes in the air lying just over the skin. In trials to test the running suit, study participants donned the garment and worked out on exercise treadmills and bicycles while researchers monitored their temperature and humidity using small sensors positioned across their backs. After five minutes of exercise, the suit's flaps started opening up, right around the time when participants reported feeling warm and sweaty. According to sensor readings, the flaps effectively removed sweat from the body and lowered skin temperature, more so than when participants wore a similar running suit with nonfunctional flaps. When Wang tried on the suit herself, she found that the flaps created a welcome sensation. After pedaling hard for a few minutes, Wang recalls that "it felt like I was wearing an air conditioner on my back." The team also integrated the moisture-responsive fabric into a rough prototype of a running shoe. Where the bottom of the foot touches the sole of the shoe, the researchers sewed multiple flaps, curved downward, with the cell-lined layer facing toward—though not touching—a runner's foot. They again designed the size and position of the flaps based on heat and sweat maps of the foot. "In the beginning, we thought of making the flaps on top of the shoe, but we found people don't normally sweat on top of their feet," Wang says. "But they sweat a lot on the bottom of their feet, which can lead to diseases like warts. So we thought, is it possible to keep your feet dry and avoid those diseases?" As with the workout suit, the flaps on the running shoe opened and lit up when researchers increased the surrounding humidity; in dry conditions the flaps faded and closed. Going forward, the team is looking to collaborate with sportswear companies to commercialize their designs, and is also exploring other uses, including moisture-responsive curtains, lampshades, and bedsheets. "We are also interested in rethinking packaging," Wang says. "The concept of a second skin would suggest a new genre for responsive packaging." "This work is an example of harnessing the power of biology to design new materials and devices and achieve new functions," says Xuanhe Zhao, the Robert N. Noyce Career Development Associate Professor in the Department of Mechanical Engineering and a co-author on the paper. "We believe this new field of 'living' materials and devices will find important applications at the interface between engineering and biological systems."